The Site Menu appears on every page of a site. It provides a set of convenient links to make navigating your site easier. Check or uncheck the "Menu As" box. 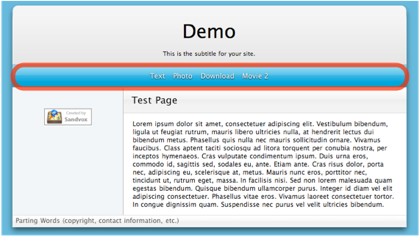 Only the first seven top-level pages will be automatically added, since most site menus cannot contain many more entries. The titles of the pages in the site menu come from the page titles. However, you may want an abbreviated title to show up in the site menu. To do so, use the Page Inspector and enter a shorter name there. Pages appear in the Site Menu in the same order as the Site Navigator. Thus, you can change the ordering of the site menu by rearranging the pages there. If you have many pages in the site menu, they may take up more width than is available on a single line. How this is handled depends on the design used. A few designs (e.g. "Open All Night") with fixed frames and graphics are not expandable. The overflowing menu items are hidden. All other designs will add extra lines to the site menu as needed. This may not be aesthetically pleasing, so you should not let your site menu be too long. 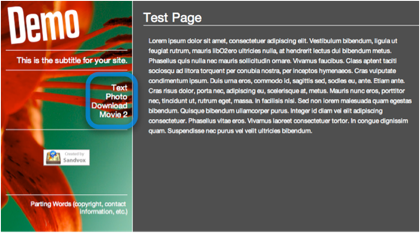 A few designs use an image as the background to the site menu. If so, once the menu spills onto a third (or more) line, this image may not appear correctly.